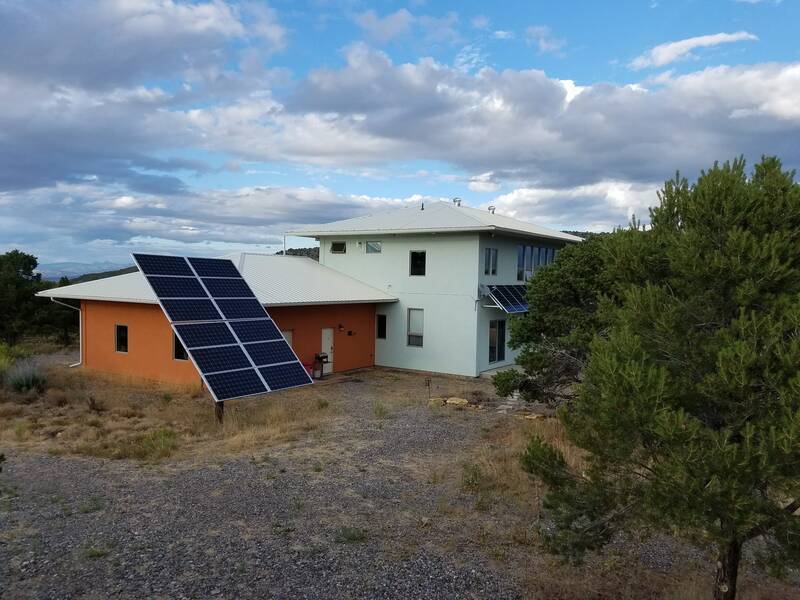 South Side shows solar panels (click to see larger, more photos below). 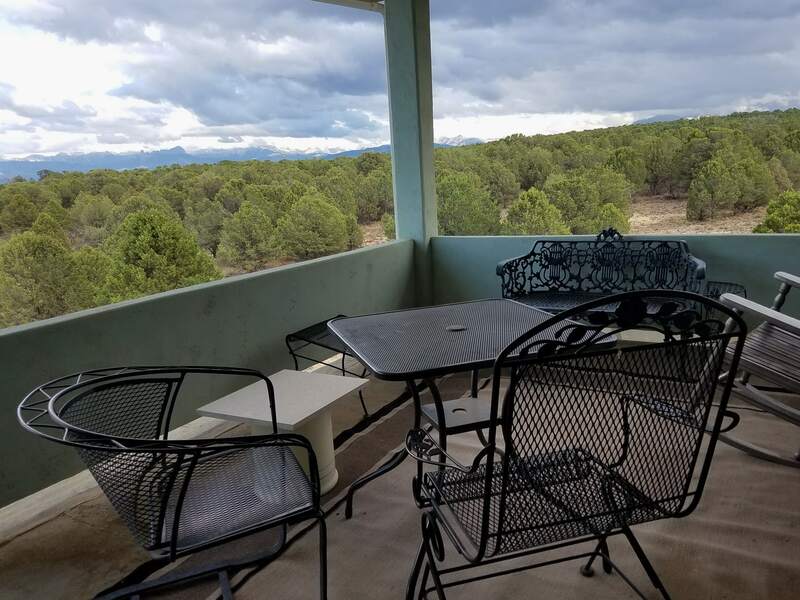 A Wall of South-Facing Windows open to spectacular views of both the Sneffels and Cimmaron ranges, and you can see the Grand Mesa to the north. 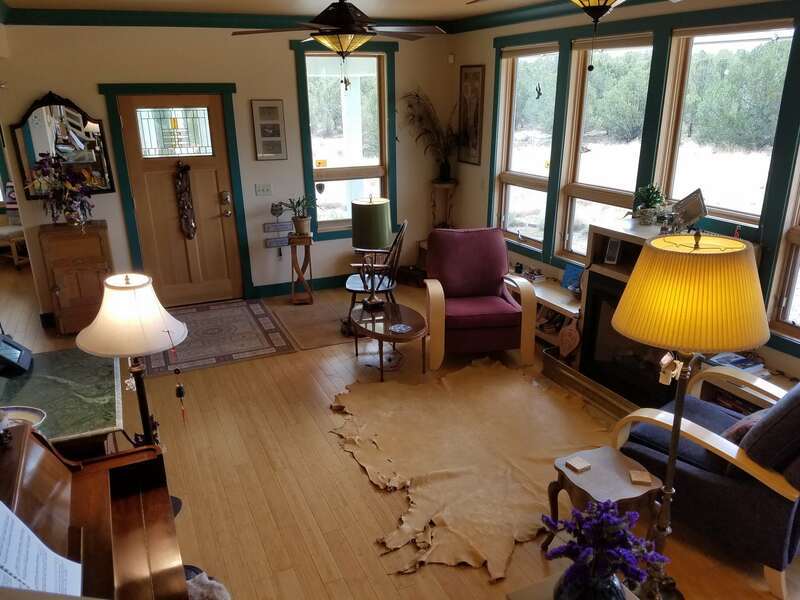 Super quiet and remote feeling, yet just 20 minutes to both Ridgway and Montrose year-round. 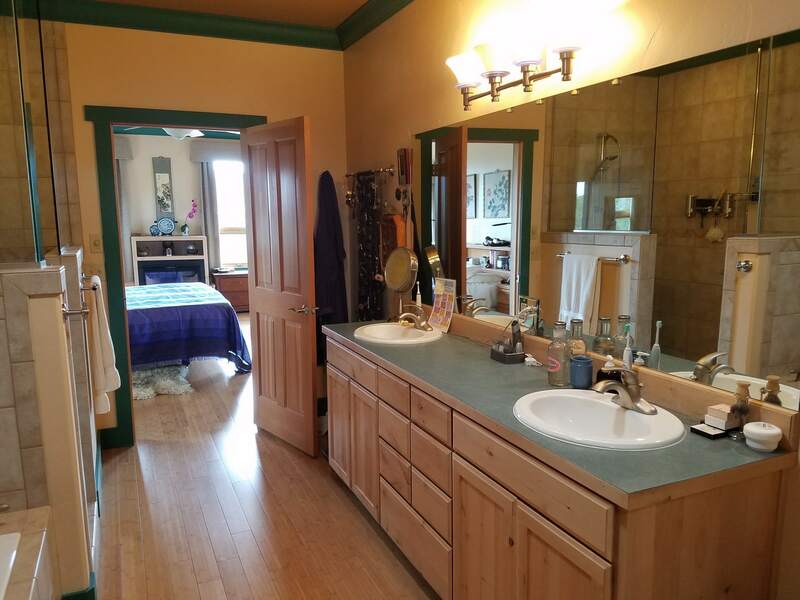 Lots of elbow room: you can feel the privacy with no neighbors that are too close. There are even views at night: dark skies let you see the Milky Way. 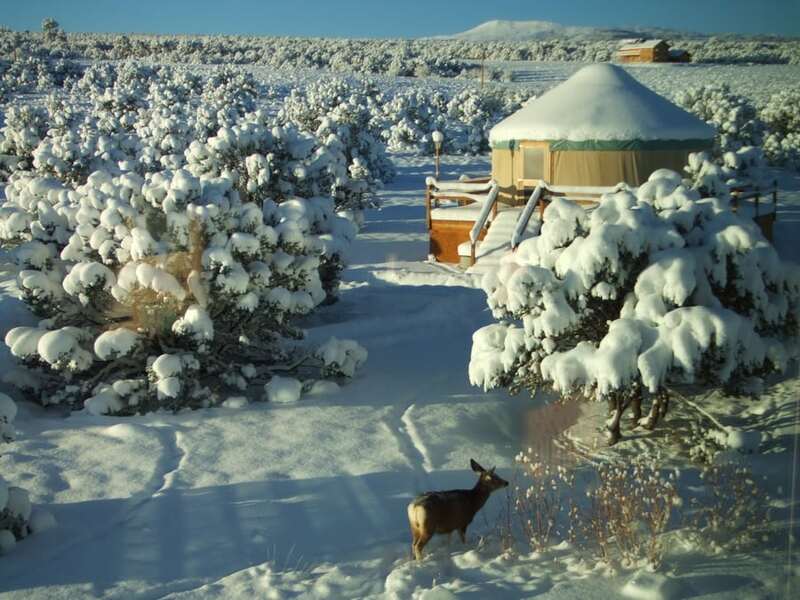 Deer and elk are frequent visitors. Even eagles visit this serene acreage. 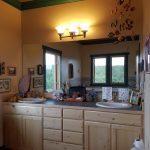 The header image on this page was taken from this home (yep, zoomed in a bit so you can see the approximate level of detail we see with the naked eye). It’s loaded with features, detailed below. 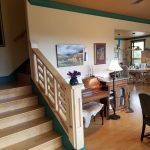 Designed by us in a modern Prairie style, a local craftsman built this 2-level home with two upstairs master suites plus a combination downstairs guest/media room. 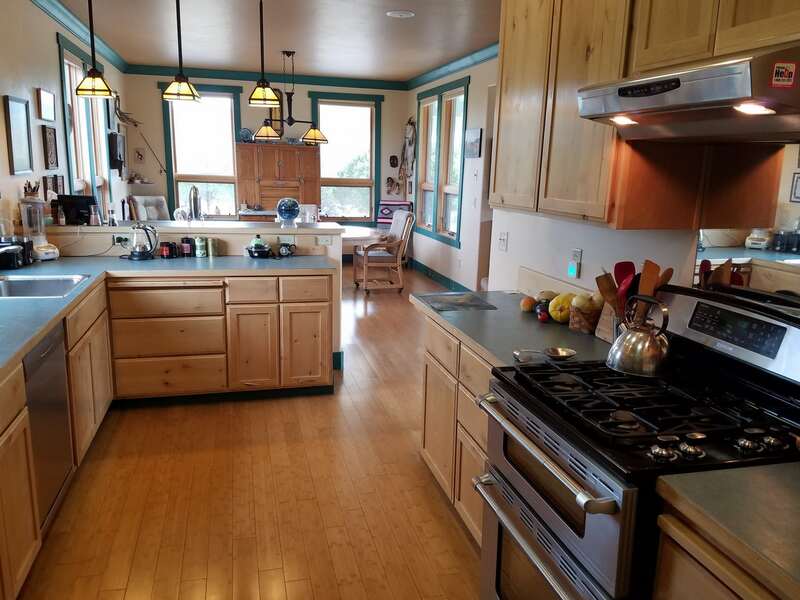 The wide open floor plan sports a huge kitchen plus large pantry with custom cabinets and tons of storage space, and large dining room accommodates an 8′ table. Covered upstairs deck affords amazing views for morning coffee/evening cocktails, and thunderstorm watching. 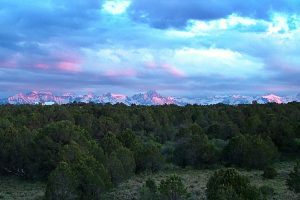 It’s impossible to get it all in: a spectacular alpenglow sunset on the Cimmarons, taken from the upstairs deck. Enormous 2-1/2 car attached garage (the half for ATVs, motorcycles, bikes has its own roll-up door). Garage has abundant storage shelves, lots of lighting, and workbench. 240V plug for your hybrid or electric car. June 2005: sunset from deck (Sneffels range). 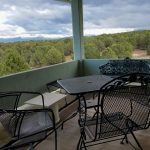 A covered upstairs deck affords amazing views for summer dinner and cocktails. 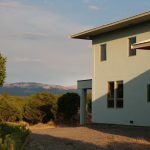 Multi-zone in-floor heating is supplemented by lots of passive solar gain in winter, yet the house is shielded by extra-wide overhangs in summer to keep things cool. 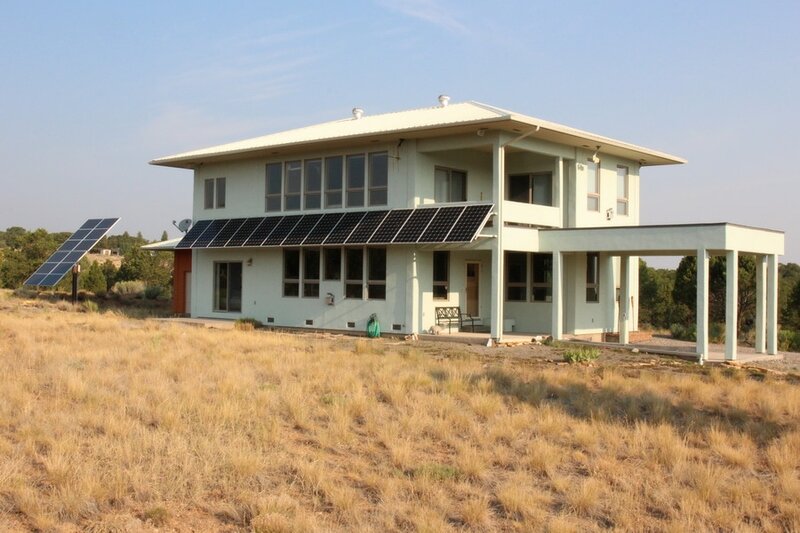 The house has 6kW of solar panels (see photo above), with battery backup for critical loads (see details below). Extra amenities include custom-made alder wood cabinetry throughout, crown molding, 9 foot ceilings on both floors, spectacular soaking tub with a view in one master bath and a 4×6′ shower in the other, hipped metal roof, broadband Internet, in-ceiling speaker system, ceiling fans, walk-in closets. 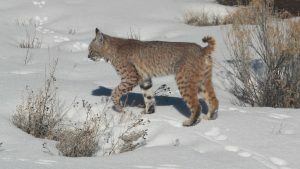 The neighbors are wild too! This is Bob. We’ve seen deer, elk, bald eagles, golden eagles, rabbits, ermine, hawks, owls, and now and then, a badger! 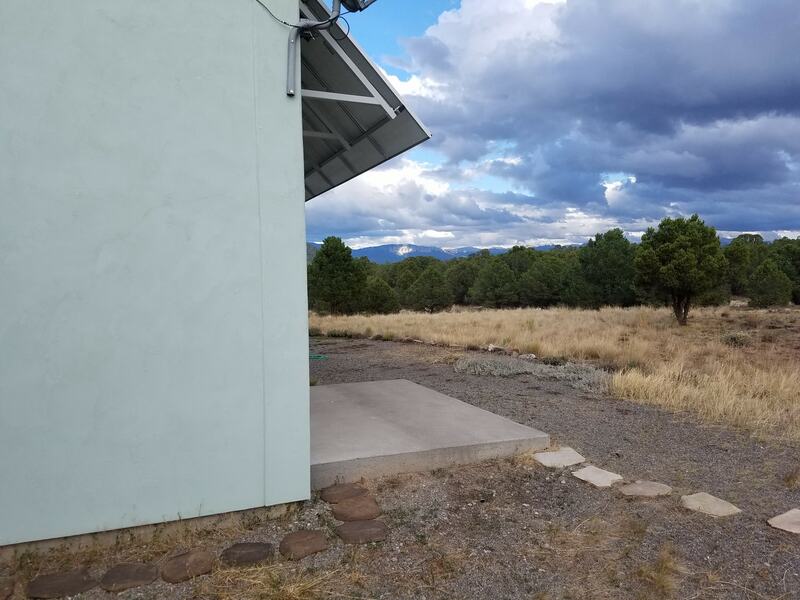 The full 40-acre lot is kept mostly wild — no mowing or watering needed! 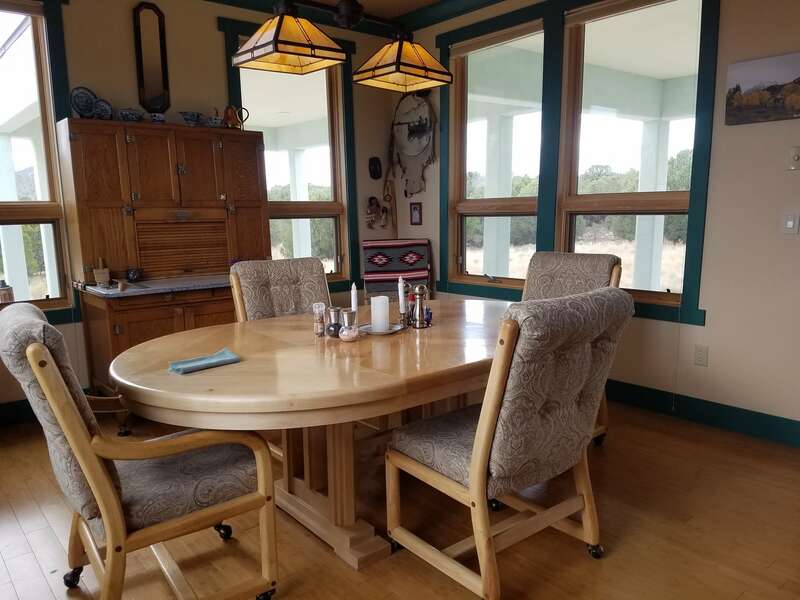 And speaking of water, this home is in the Tri-County Water Conservancy district, which provides fabulous water at a reasonable price. If you’re looking farther south on the mesa, know that Dallas Creek Water District is by far the most expensive in the state; $80/month is pretty typical (our water bills are usually less than $25 for two months!) Still, to save water (and energy), both our master baths have on-demand pumps to bring hot water up to the taps without one drop going down the drain. 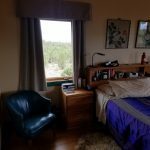 The house is on the west side of the county road, which means any dust thrown up by passing cars doesn’t end up at the house. 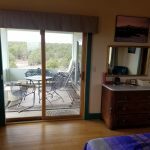 It’s close enough to not have to wend your way around to get to the road, but far enough away to keep things quiet and private! 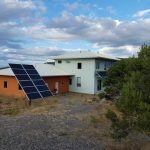 Built green from the ground up: super-insulated, water and energy efficient, and solar panels make most of your electricity: save $1500+ every year. 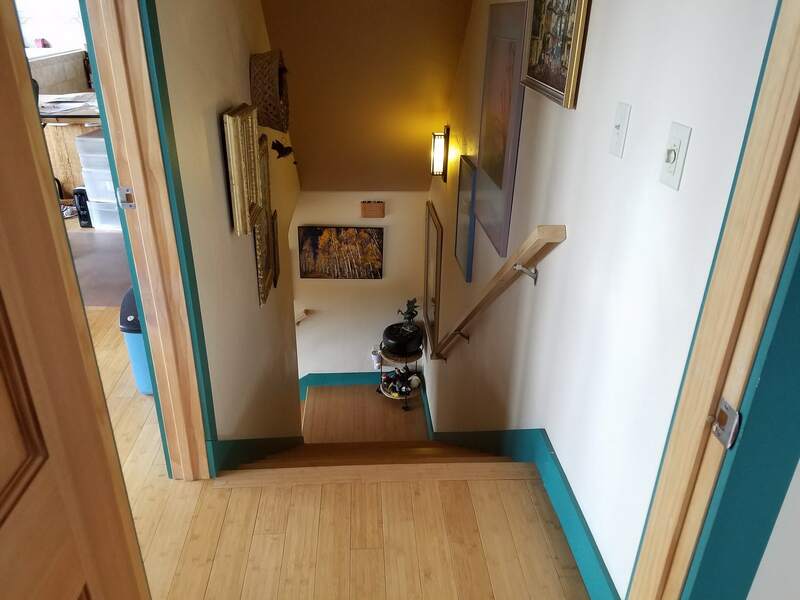 Bamboo floors throughout: more durable than oak. 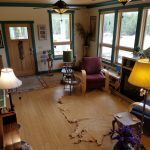 We specified extra insulation in the floors, walls, and ceilings and even between the rooms for extra efficiency and quiet. 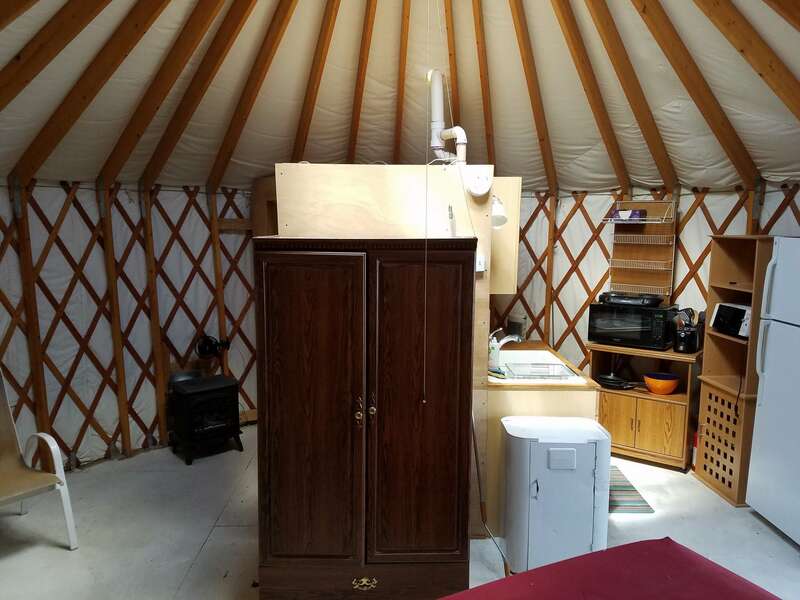 An accessory 312 sq ft yurt provides extra guest or rental space (which makes the separate propane tank handy). See below for information about fire safety — the house was designed with that in mind. January 2016: The Cimmaron Range from our deck. Extra amenities include in-ceiling speaker system, ceiling fans, custom-made alder wood cabinetry throughout, crown molding, a spectacular soaking tub with a mountain view in one master bath and a 4×6′ shower in the other, broadband Internet (currently 15 MBPS, higher possible), walk-in closets, four-panel doors, double-pane windows, and nine-foot ceilings on both floors. Maintenance-free yard with ample parking, and far enough from the county road to avoid its noise and dust. 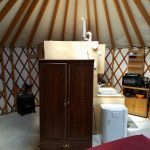 An accessory yurt provides extra guest, office, or rental space: it has a kitchen area, bathroom with shower, and a separate propane tank. 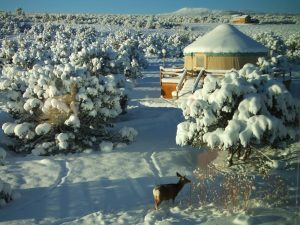 The yurt, from the house, with the gorgeous Horsefly Mesa in the background. 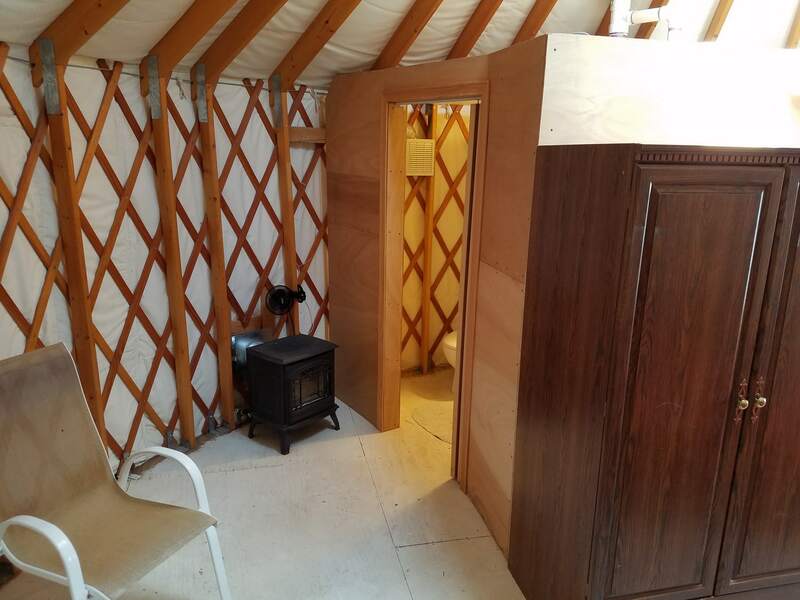 About the Yurt: Made locally (in Montrose), the yurt is 20′ in diameter, or 314 sq. ft. 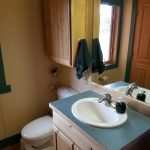 It has a bathroom with shower (plumbed into the house’s main septic tank), power, and heat fueled by its own propane tank — and, for good measure, there’s a pipe to the main house propane tank if you prefer. We lived in the yurt Fall 2003 through Spring 2004 while the house was being built. 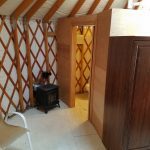 The outer canvas of the yurt is thus getting weathered: we can replace the skin for you, or you may prefer to remove the yurt and, since it’s already set for plumbing and power, replace it with a stick-built guest house. 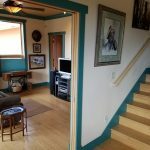 You can contact the owner here and usually set up a showing very quickly. 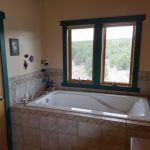 Or contact our Agent: Marc Hitchcox at 970-729-3055 (cell). 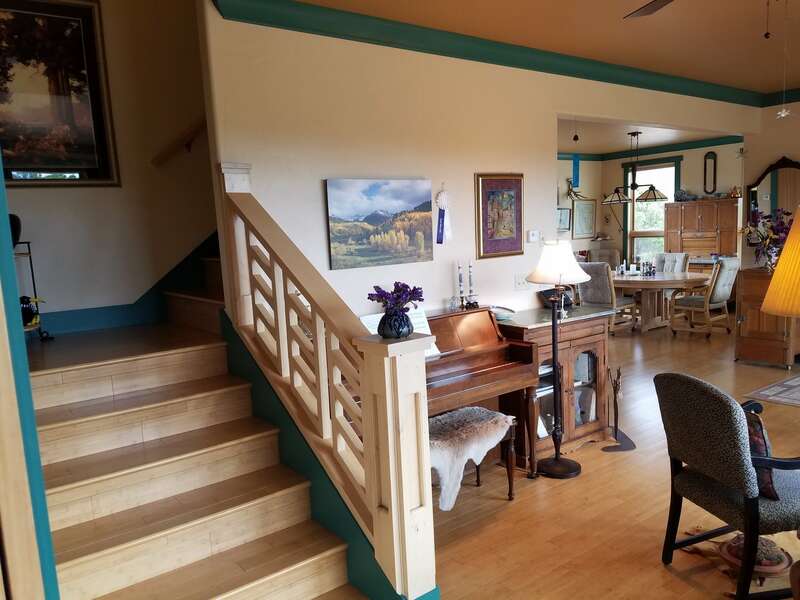 2,379 square feet (per county records), plus an attached 870 sq. 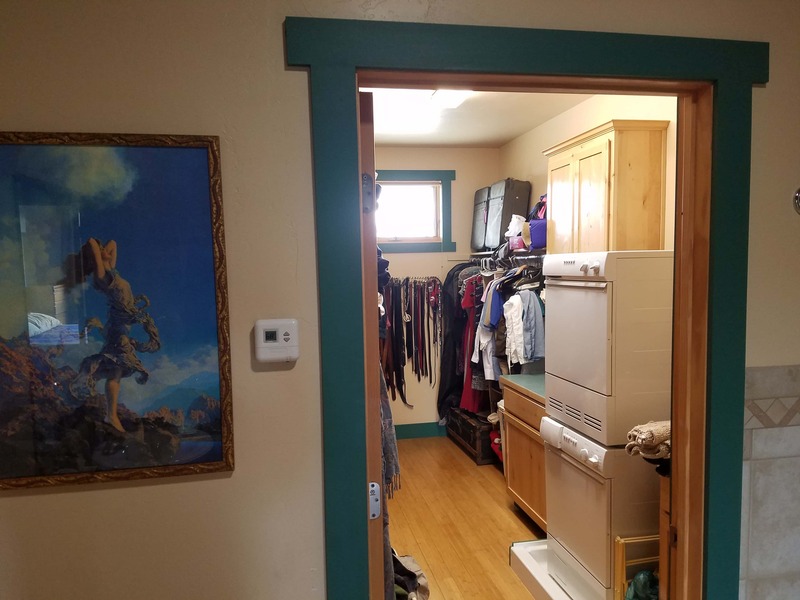 ft. garage with huge amounts of storage shelving (and a work bench), plus a covered upstairs deck, plus a covered entry patio and carport, plus the 300+ sq. 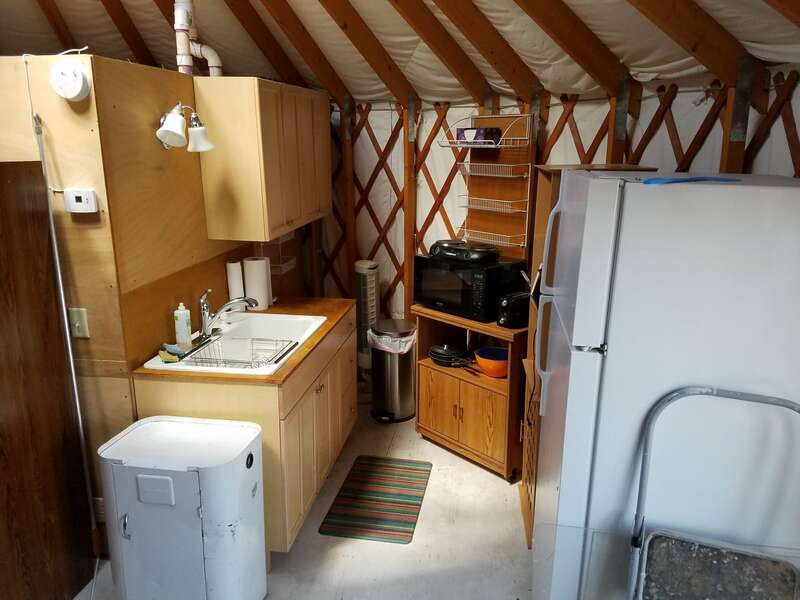 ft. yurt (office space or guest house)! 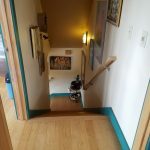 Hardwood (bamboo) floors throughout — even in the closets. 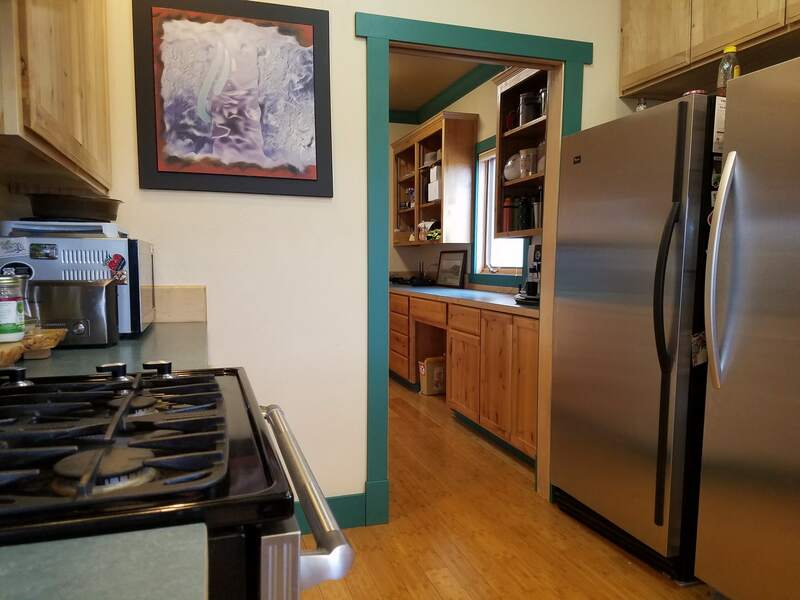 Dream kitchen with huge amounts of cabinet and counter-top space, plus a massive walk-through pantry with even more cabinet and counter-top space. 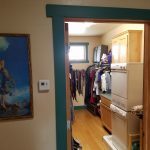 Custom alder cabinets throughout: kitchen, pantry, bathrooms. Built-in custom alder window seats/bookcases below south-facing windows in main master suite and living room. Multi-zone in-floor radiant heat with high-efficiency boiler (which happens to also do a great job of ensuring the garage never freezes). Gigantic garage has a separate roll-up door for ATVs, motorcycles, or sports car, multiple storage shelves, and a work bench. Professionally installed fire/burglar alarm system monitored 24×7 by local alarm company. Ethernet cabling built-in (though a WiFi access point in the “network closet” covers the entire house very well). In-house booster installed for Verizon cell phones (you should be able to repoint for AT&T/T-Mobile/Sprint coverage if preferred). 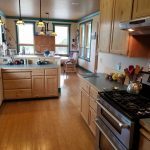 Gas range, separate fridge/freezer, high-efficiency washer/dryer, high-efficiency dishwasher, whole-house attic fan, and whole-house water filter system all included. 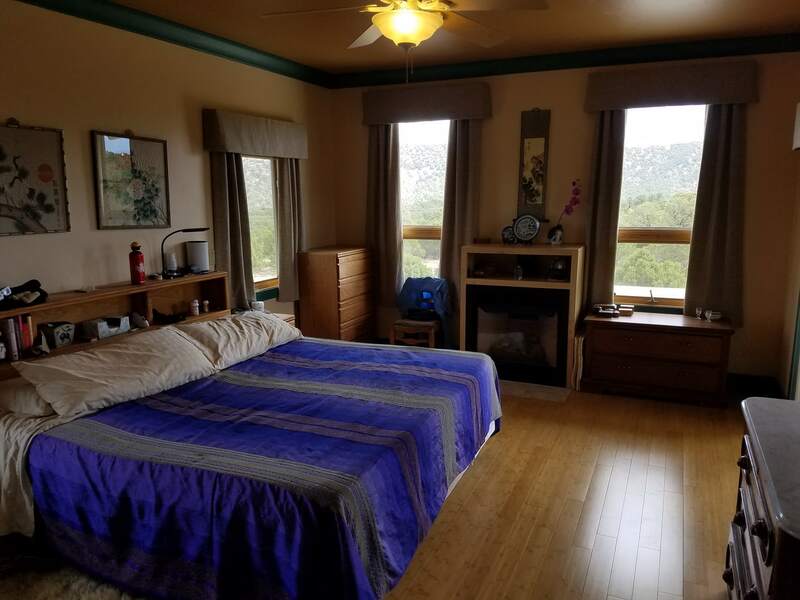 Ceiling fans in all bedrooms and living room. In-ceiling speaker system in both master suites, living room, and between the kitchen and dining room (wires home runs to guest room/media room), all with individual volume controls. 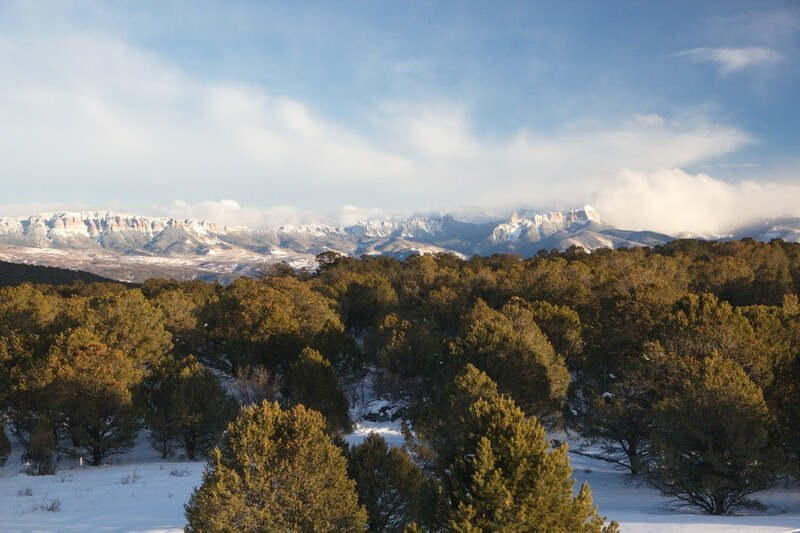 Spectacular views of the Sneffels range (south), the Cimmaron range (east), Grand Mesa (north), and Horsefly (southwest): don’t choose, see it all! A maintenance-free battery backup keeps critical loads (fridge/freezer, boiler, main master bedroom) online during power outages. It’s dark here: you can see the Milky Way at night! Hipped metal roof, stucco exterior. Designed from the start to be “green” and efficient. Extra insulation throughout, and then the house was stuccoed for more. 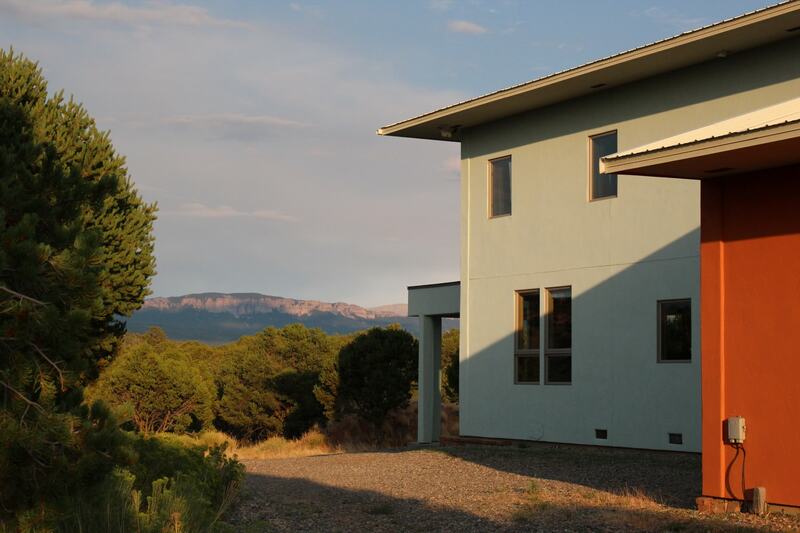 Water-efficient appliances, xeric landscaping where the land hasn’t been kept wild. 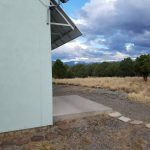 Solar power — enough for 100% of average needs. Passive solar heating (shielded by solar panels in summer to help keep house cooler). Full vapor barrier added to crawlspace. 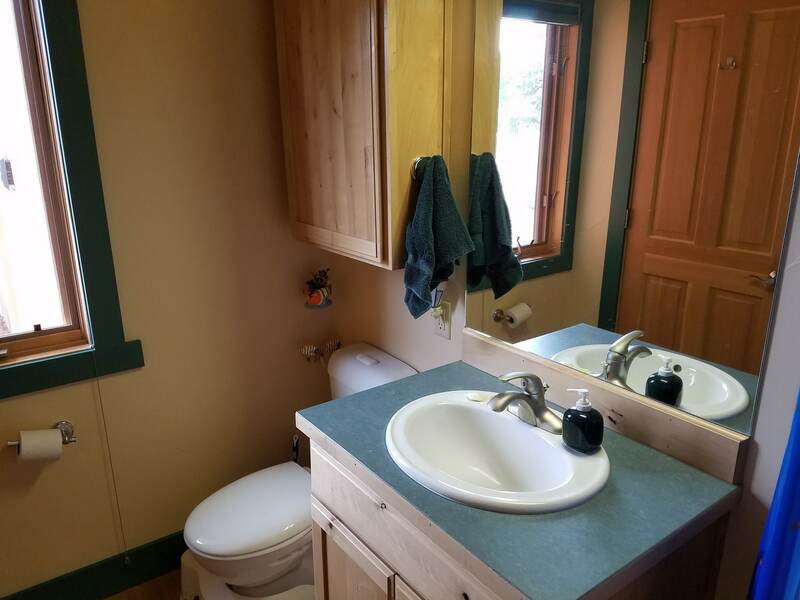 Upstairs bathrooms have an on-demand hot-water pump to not waste water for showering. 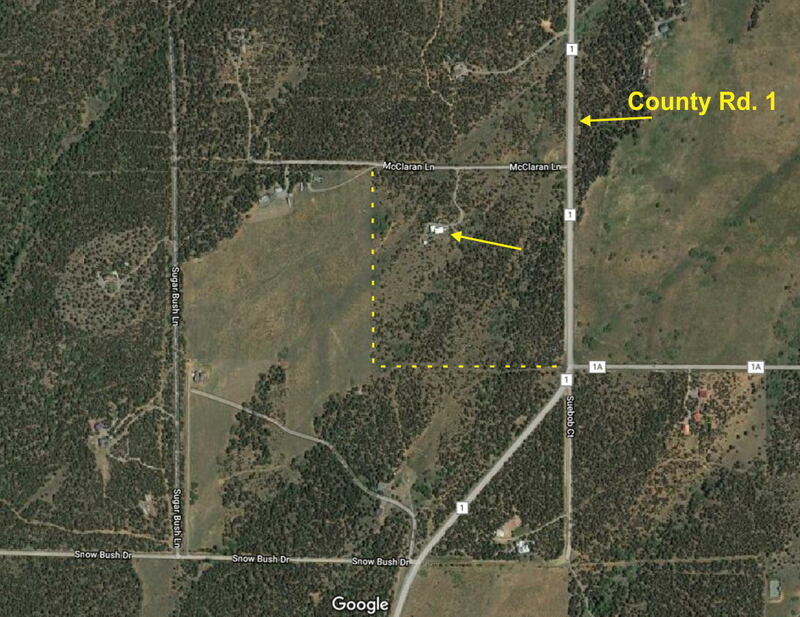 Aerial view of property and surrounding area shows superb fire mitigation. Prevailing winds come from the southwest (lower left: top is north). Like all western states, Colorado sometimes gets wildfires. 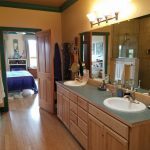 Here’s what we’ve done to provide significant extra safeguards for this home. 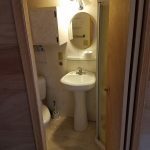 The house is specifically designed and built to be fire resistant. 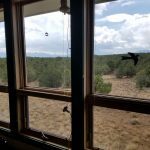 For instance, we have multiple smaller windows rather than huge windows, which are more easily shattered by heat to let in fire. Stucco exterior helps too. No trees within 30′ of the house. Ground around house is graveled to help prevent fire spread to the house. Plants in this area are low and xeric. Click the aerial photo to see how trees have been thinned to the southwest — the direction prevailing winds come from. Then, after all that, we brought in Colorado State Forest Service professionals to inspect it all, and had them supervise even more anti-fire work. The Mesa, by the way, also has its own (very good!) fire department, and is extremely proactive in helping prevent wildfires, rather than just fight them. County Emergency Management has disaster plans in place for multiple scenarios, including wildfire. You want county officials to pay attention to this stuff, and they do! 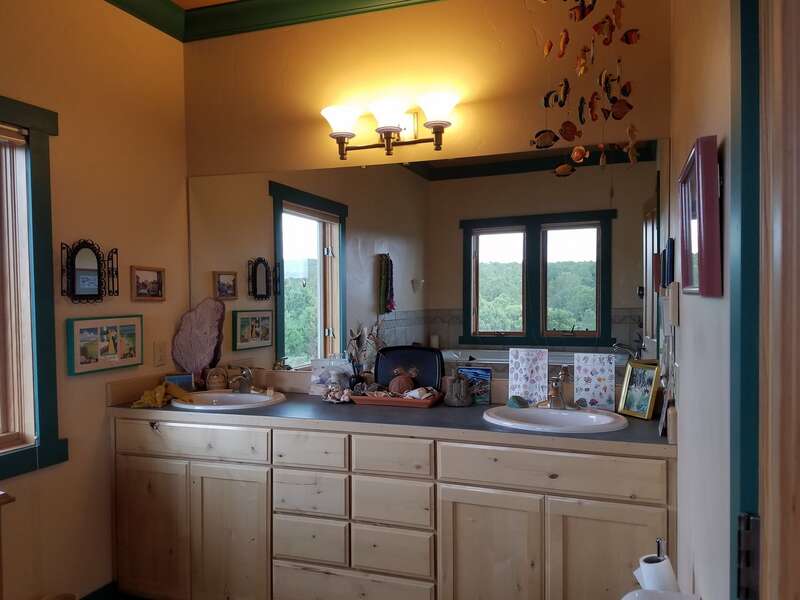 Last, this home is ideally sited to allow quit exit both toward Ridgway or Montrose, if needed. 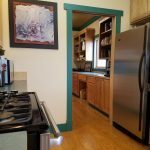 Located in the Ridgway School district (and they have bus service), and quick access to Montrose (20 minutes away) for groceries or airport trips. No homeowner association, covenants, or restrictions to tell you how to live. You can even have horses or livestock if you wish. Main house has buried 1,000-gallon propane tank (you own it, so you can shop around for the best propane price). 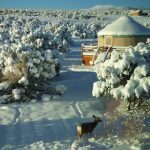 Yurt has its own 500-gallon tank (you own it for the same reason). Landline phone service available, should you be among those who haven’t switched to cell only (not currently installed). Are you a skier/outdoor recreation fan? 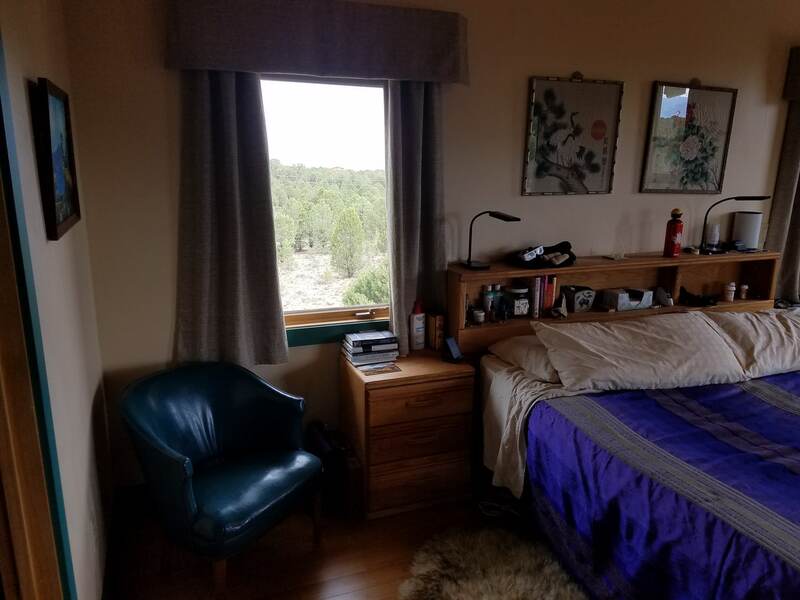 We’re not just an hour from Telluride Resort’s free parking: we’re also just under two hours from the Powderhorn (Grand Mesa) and Purgatory (Durango) resorts. And we’re just over two hours from Crested Butte, three hours from Aspen, and under four hours from Vail. 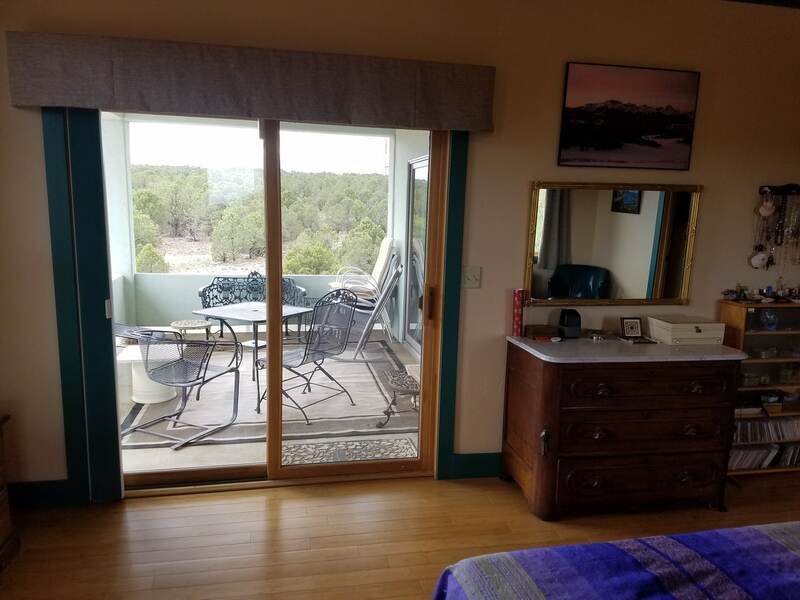 We’re also just 45 minutes from the Black Canyon of the Gunnison National Park, and about three hours from Mesa Verde National Park. Not to mention just 30 minutes from Ouray’s world class Ice Climbing park. 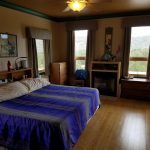 Plus, you can see multiple 14,000′ mountain peaks. There’s a lot to do here, summer and winter. 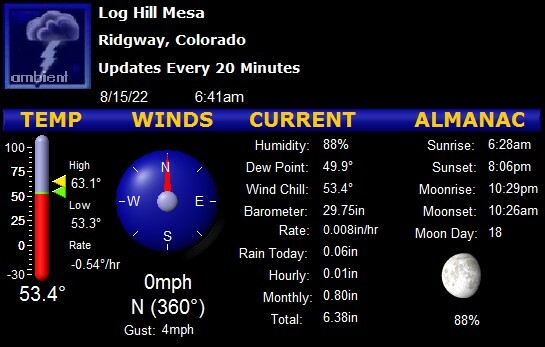 If you wish, rights to this web domain and the on-site weather station can be included in the purchase. Click any photo to enlarge, or to scroll through them, with captions. 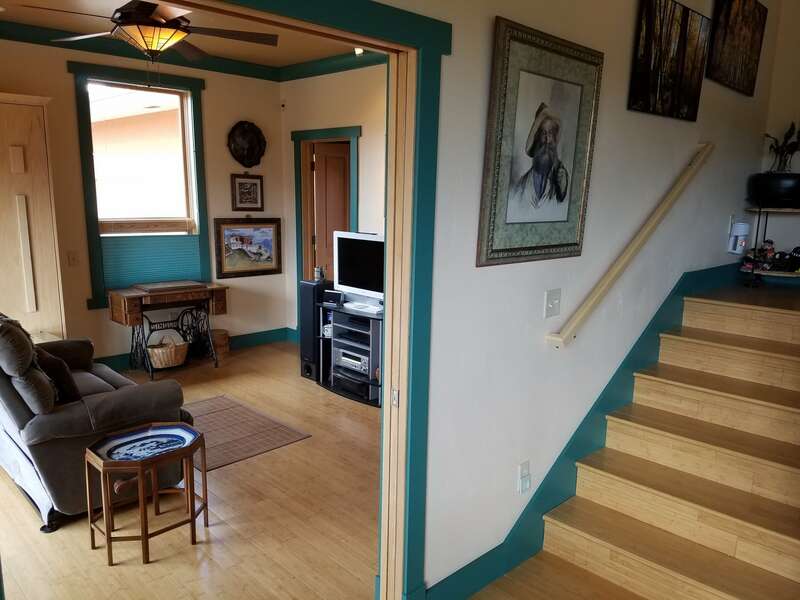 Living room toward front door (from stairs). Living room, toward dining room. Kitchen looking toward pantry. Yep: separate fridge and freezer so you don’t have to go to the store as often. Kitchen looking toward dining room. 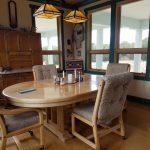 Dining room accommodates a large table (and great views). On a clear day, you can see the Grand Mesa to the north. Master 2 has a gas fireplace. Probably should have turned it on for the photo! Both masters have easy access to the covered deck. 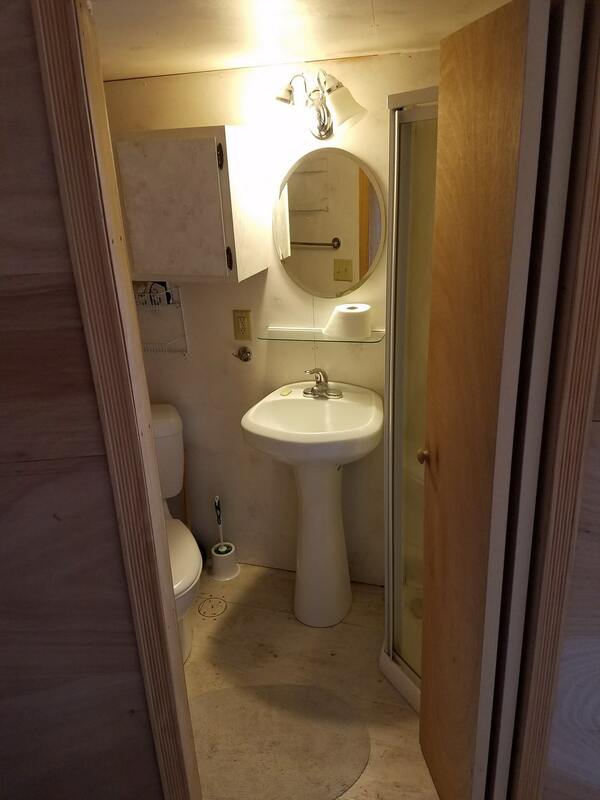 Master 2’s bath has an awesome shower — 4×6′! 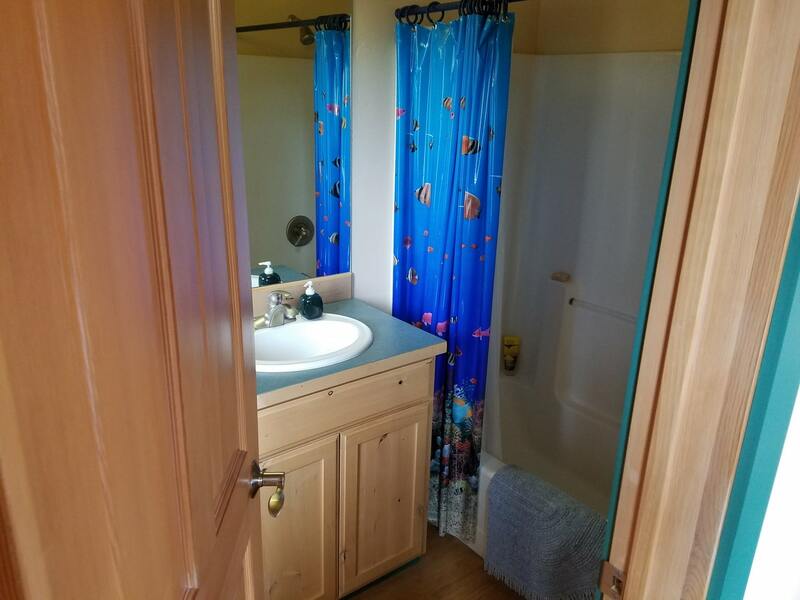 Custom tilework, too. Yep: the washer/dryer are in Master 2’s closet. Most laundry is clothes and bed linens, so keep the machines handy! 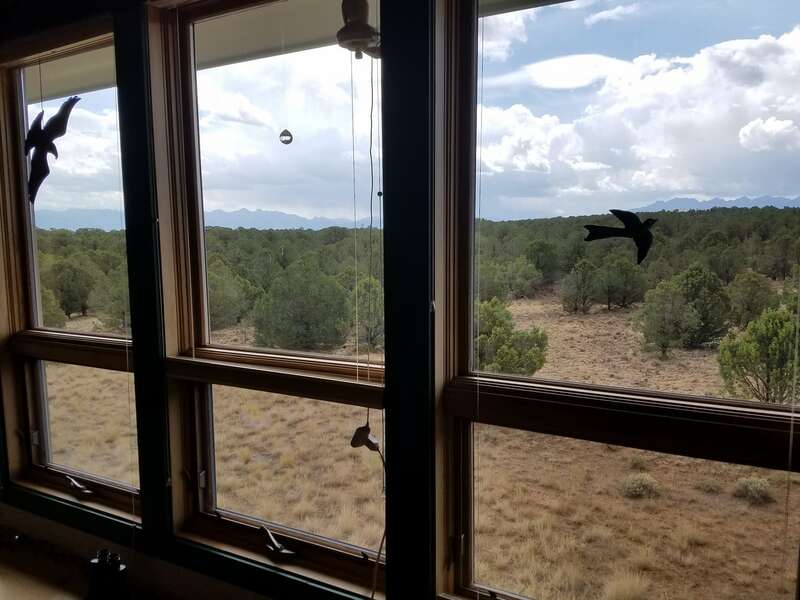 Just a small part of Master 1’s view (it’s been stormy recently, hiding the mountains). Yeah: we’ll leave the webcam for you! 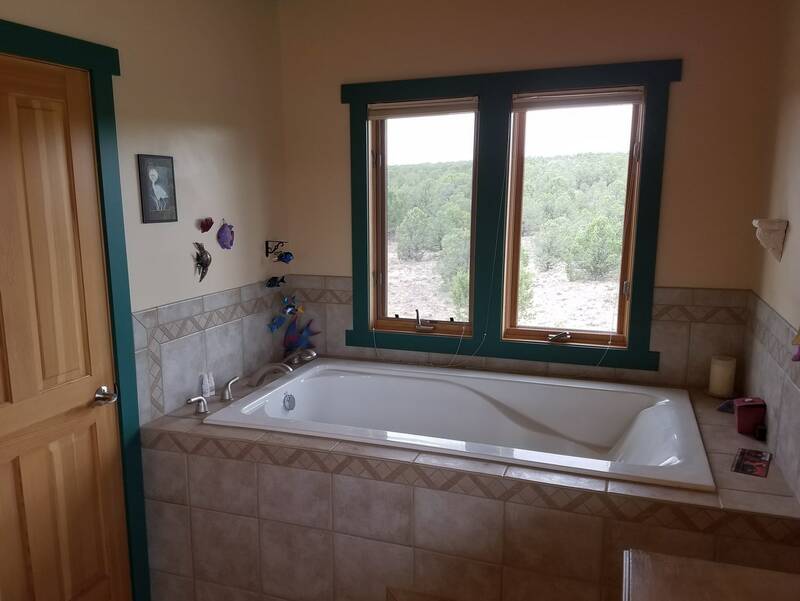 Master 1’s bath — “Tub with a View”. 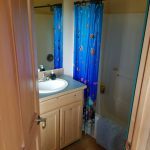 Master 1’s bath, with custom cabinets. Guest room doubles as TV room. 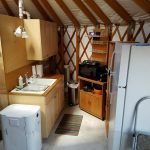 Yurt exterior on a sunny day.